If you’re looking to buy recreational property, it’s important to know the property you choose has been well cared for. But how can you be sure that’s the case? 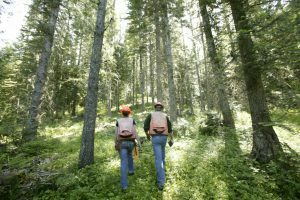 One easy way to get peace of mind is to buy from a well-respected timber company, like PotlatchDeltic, which is known for its commitment to quality forestry practices. This is shown in the fact that all PotlatchDeltic properties carry at least one of two well-respected certifications, from the Forest Stewardship Council® (FSC®) and the Sustainable Forestry Initiative® (SFI®). “These certifications are proof that PotlatchDeltic uses quality management practices which are environmentally friendly and effective in growing quality trees,” says Ricky O’Neill, Manager of the Arkansas Region for United Country – Neeley Forestry Service, part of the PotlatchDeltic Preferred Broker network. Buying a property that’s been managed effectively for timber is also appealing in other respects, O’Neill says. Certified properties have trees retained near creeks and lakes to promote clean water and abundant fish, and provide habitat for wildlife seeking shelter and bedding. “It just makes sense to buy a property from a timber company that has the knowledge and experience to take the right management approach for each property it owns,” says O’Neill, who was named Forestry Educator of the Year by the Arkansas Forestry Association in 2016. Recreational buyers in Arkansas are often looking at the investment side of a purchase, even if it isn’t the main reason they are buying, says O’Neill, who routinely works with buyers from all over Arkansas and from nearby states like Louisiana, Mississippi and Texas. Buying a property with quality timber is a win-win, providing a place for quality recreation and a way to build long-term financial value. PotlatchDeltic’s Arkansas properties are rigorously reviewed to maintain SFI and FSC certification. Auditors visit properties in person, reviewing forest management activities and interviewing logging contractors and company personnel. When an audit is completed, PotlatchDeltic gets reports that detail how well the company is doing in following best practices. Make some time to talk to one of the recreational property sales experts in the PotlatchDeltic Preferred Broker Network about buying a well-managed property to call your own. Email or call to get the process started! This entry was posted in Arkansas, Awards & Recognition, PotlatchDeltic, Timber Price and tagged #PotlatchDeltic, #PotlatchDelticLand, Forest Stewardship Council, FSC, Neeley Forestry Service, Ricky, SFI, Sustainable Forestry Initiative, Timber Management. Bookmark the permalink.